As I ate breakfast in the Ganesh Himal Hotel's restaurant, a familiar song came on in the background. I identified it in a second—I'd heard it many times. This was from the Tibetan Incantations CD, which I'd bought in 1998 after hearing it repeatedly on my last trip to Kathmandu. 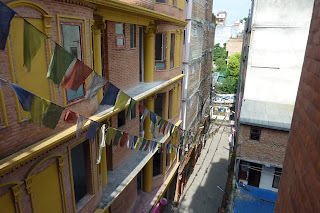 "Nice to know that Kathmandu's Hotel California isn't, in fact, Hotel California," I thought. Though I did get sick of this CD over the next week. Today I had to find a hotel, as there was no room at the inn tonight. 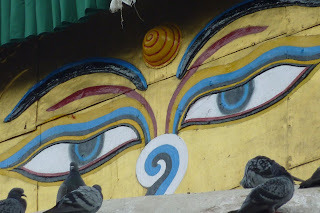 I initially thought I didn't mind as the Ganesh Himal is a bit of a walk from central Thamel. Not too bad, but just enough that I was unlikely to scamper out on a whim. And for some, being out of Thamel is a good thing. It's noisy, crowded, and full of touts and tourists. I am not totally opposed to such a place. I am a city gal, addicted to convenience. 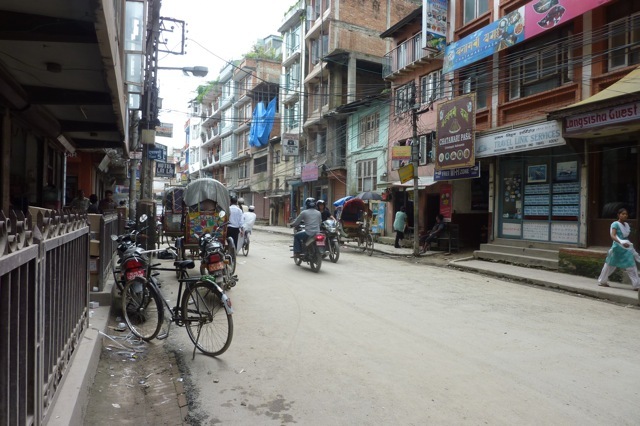 But as I walked around visiting hotels, I learned that I did mind being kicked out of Ganesh Himal very much. The other cheap hotels were worn-out, and Tibetan Incantations was probably representative of the last time the management had invested in anything new. I did try to get into a few places that were lauded on TripAdvisor but had no room. "This is low season," said more than one receptionist. "I don't know why there are so many tourists in August this year." I did know why, and doubted there would be anymore slow Augusts. July and August is when China goes on holiday and the new breed of Chinese traveler was expanding into visiting neighboring countries. I must've looked at a dozen budget hotels over the course of the day, and in my opinion, they were crap. I was going to have to up my budget to mid-range or lower my standards. I decided I could tolerate either Moonlight or the one nice room in the corner at Hotel Utse, but neither seemed all that special. I went back to Ganesh Himal to see if any rooms had opened up. "Sorry. But you can try this place." The receptionist gave me a scrap of paper listing a reasonable place around the corner. But I'd already decided to go back to Hotel Utse. At least it was in the center. A man hanging out waiting for a friend to get off work said "If it doesn't work out, I think you'd like Kathmandu Resort Hotel. It's brand-new, across from Kathmandu Guesthouse." "Sounds expensive," I said doubtfully. "It's a little more," he acknowledged. 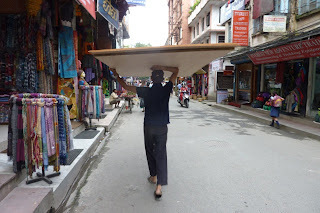 He wanted to walk me to Thamel and I had to actually explain to him that I wanted to go alone. He was nice enough but I didn't need someone along as I sweated and stumbled around. And I couldn't sort out if he had an agenda or not. I left him, got a taxi, and went to Utse. They'd rented out the room I'd looked at earlier and the others were much more tired. I ripped up the registration card I'd begun filling out and went back outside. My 32-pounds of—what the hell was I carrying? How come I had so much stuff?—something were starting to weigh on me. I went to Kathmandu Resort Hotel. Not only was it right in the center, but it was across the street from where I'd dropped off my laundry this morning. I went up the stairs and asked for a room. "We have one left...but...well, come with me." I followed the clerk to a room where there had been a leak in the bathroom ceiling. The leak had been repaired but the cosmetic damage to the ceiling had not been repaired yet. "I'll give you a good price since you're staying a week. $30 a night, including breakfast." That's twice what the Utse or Moonlight would have cost me, but not too different from Ganesh Himal, where I'd had to pay for breakfast. And the room was new and in the center, near all kinds of shops and restaurants.